Create a lovely, cheerful and delicate way for customers and clients to share your services or products with others, in the form of custom made gift certificates. 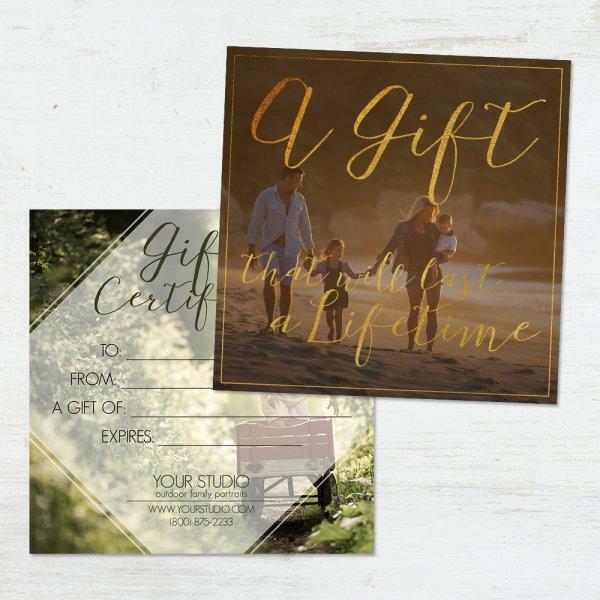 Create a unique and memorable gift option this vintage inspired design – provide professional looking gift certificates to your clients. Set your business above others with this new “Gift Certificate” template by Sleeklens, offering a great option for your clients to give a memorable gift. Our new gift certificate template allows an easy yet professional way to create your own gift cards, catering to your specific business needs. 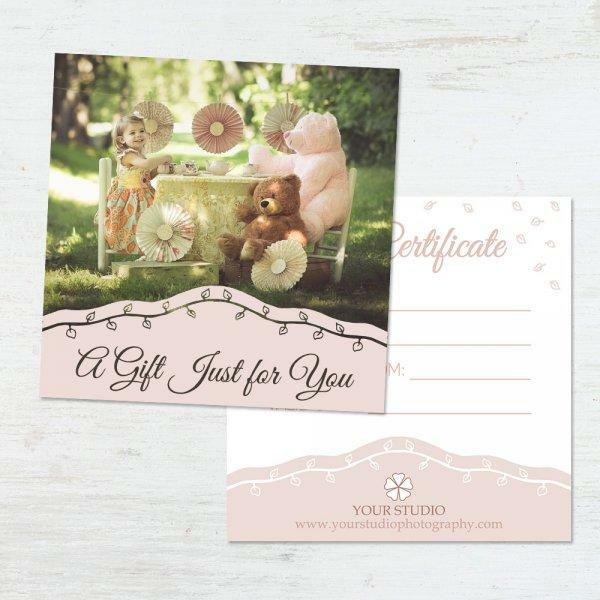 Feel inspired by this cute Gift Certificate Template for Adobe Photoshop! The use of gift certificates has been on the rise over the past few years and there is a good reason as to why this has been happening. To begin with, gift certificates or gift cards as many are fond of calling them do allow the recipients to select their preferred gifts and this works well in ensuring that the gifts they get are meaningful to them. As such, it will be a great idea to consider printing personalized gift certificates using our specially designed Gift Certificate Templates which are easy to use and affordable as well. Gift certificate templates make it easy for people to give out gifts to their friends and family members whenever there is need to do so. In most cases, choosing a gift can be a daunting task especially because your customers would want to give a gift that is meaningful and special. While it might be hard for them to choose the right gift, it is always easy to hand gift cards to their friends thus giving them the power to choose their preferred items within your shop. However, when creating gift certificates, you do not want to come up with something so plain and unpresentable. Instead, it will be good to create a lovely and stylish gift certificate capable of creating a lovely impression in the recipient’s life. The gift given should be accompanied by a pleasant mood and expression and this can only happen when the gift certificate is designed professionally with a touch of class. As such, the gift certificate templates from Sleeklens are designed to offer this kind of an experience, allowing you to come up with some of the most stunning gift cards without spending a lot of money in the process. Whether you are preparing for the Christmas holidays or are creating gift cards for any occasion, the templates will always work great in making the process easier, faster and affordable. 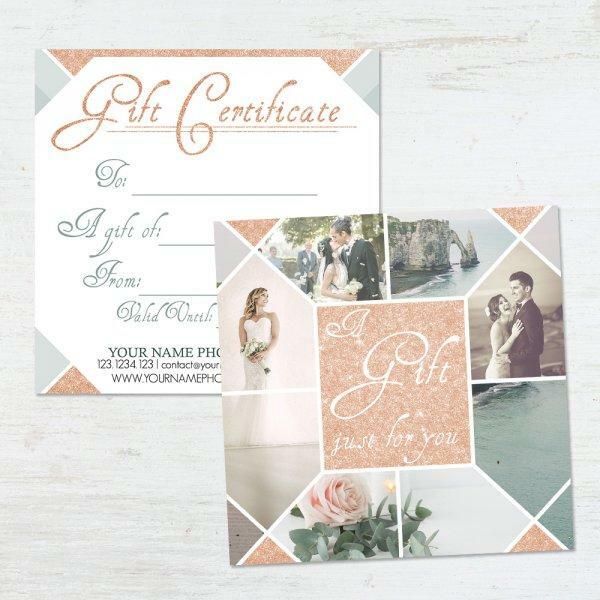 These beautiful gift card templates are ideal for different occasions including birthdays, weddings, baby showers, graduations or just the normal day to day gift-giving experiences. Each of the gift card templates comes in a unique design and effects which you can use to put a personal touch on any of your gift certificates. You can use these templates to transform your gift from a drab normal gift into a more personalized and distinctive gift that expresses something deeper to the recipient. As noted earlier in this post, gift cards are becoming popular with many people preferring them over item purchase. This is because they make giving stress-free and easier especially when one isn’t sure of what to get for a friend or family member. As such, it is prudent for business owners to be ready with such cards in order to serve their customers when the need arises. With the gift certificate templates, it is easy to design and print a gift card within a few minutes especially when the client wants something more personalized and with unique message. For example, a client could come on the wedding day looking for something unique to give to the couple. While there might be many items available, picking something in particular could prove difficult and this is where the gift card comes in. The client can opt for a personalized gift card bearing the recipient’s name and photo and the only way to be able to give them such is if you have a template ready. A gift card template gives you ready tools to create gift certificates fast and easily while inserting text that is relevant to your customer. These gift certificate templates come with completely editable text which means you can add whatever message your client might be willing to include in the gift card. In addition, the 13×13 cm Flat Card Templates make for a good-sized and presentable card which can be handled without stress. The templates offer 2 files (front and back) thus giving you more options when customizing the card with text, art or photos. Another great benefit afforded by these Gift Certificate Templates from Sleeklens is that they are affordable and therefore ideal even for businesses that are trying to establish themselves. The price tag is amazing and cannot be matched with the uniqueness of each of the templates available. Considering that nothing more is required for you to work with these templates, you will always find them to be helpful in saving on cost while adding the right amount of professionalism and glare to make every gift perfect. It is always tough to balance a personal style and creativity when creating a gift certificate and this is one of the reasons as to why you should consider using the gift card templates. You do not have to spend your money hiring others to come up with unique gift certificates for you but instead with a few dollars, you will always be able to help your customers express what they feel and how much they care for those they are giving the gifts. With the different Gift Certificate Templates, you can always add information such as the recipient’s names, the value of the gift, your name as the giver and also pictures or appropriate art. With these simple changes, you can personalize your gift certificate and give more meaning to the gift you want to give. The templates also come with an assortment of colors for you to choose the best depending on the occasion and the recipient. If the gift certificate is meant for a girl or a lady, you can always add girlish colors to make the gift more meaningful and easy to relate with the recipient. With the two sides available, there is so much you can do to make the certificate look professional, stylish and presentable in a few minutes. 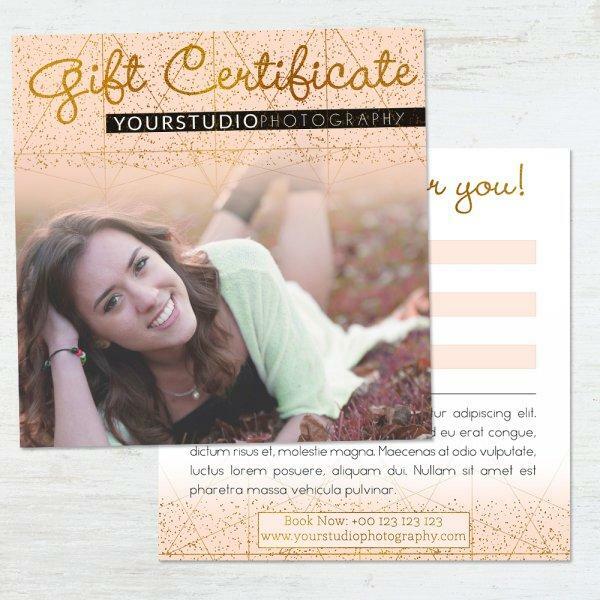 Make those moments of sharing memorable and put a smile on the face of the recipient with these amazing Gift Certificate Templates. Photoshop Templates? They are not as difficult as they seem! For the inexperienced user, facing Adobe Photoshop for the first time is a certainly a day to remember. However, and unlike many countries, it isn't mandatory to do any other thing besides what was planned. Our Photoshop templates are well-know because of working under non-destructive methods, as well as being friendly for users that might be opening Adobe Photoshop for the very first time. For that reason and many more, we decided to offer a complete guide on how to use these templates at our FAQ section, or you can even come to visit our YouTube channel and become inspired by many effects offered by our designers, as well as learning how to use them. Instead of requiring larger times of editing and resizing images, the Clipping Mask mode makes things way faster, giving us chance to edit the size or position of the images used as many times as needed: just be ready to mention it. And if this doesn't sound convincing enough, let yourself to be amazed by what our products have to offer on their own. Containing soft tones and a classical layout, our “Between Lines” gift certificate template has a style that could be suitable for such occasions as weddings and anniversaries. With this template you will be able to create and offer to your clients a gift giving option which is appropriate for situations and settings that possess more of an intimate and personal atmosphere, an occasion where loud colors and flashy tones may as appropriate. A great gift giving option which will promote your business with a warm and personal appearance. 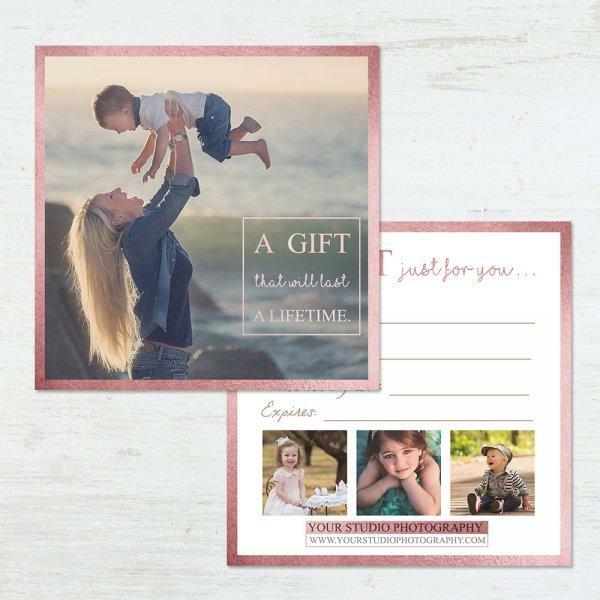 Our “For a Lifetime” gift certificate template will give everything that you will need to create custom gift certificates on a 13x13 flat card. With tones that will go great with your warmer images as well as completely editable text, you will have the ability to easily design something which uniquely caters to the specific needs of your business and customers. Allow your customers to pass on your company name with warm and creative style, while giving a gift of your services to those that they care for. Our “Lovely Gift” gift certificate template is a great option for occasions which call for softer and more affectionate tones. 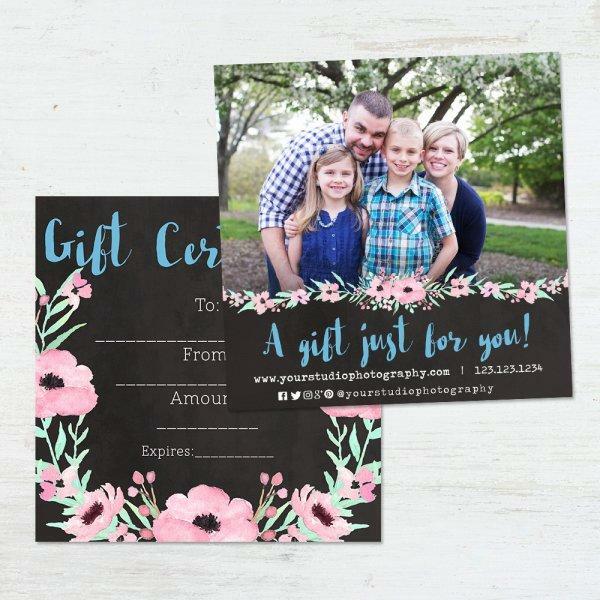 Designed for making an 18x13 flat gift card, this template includes everything that you will need to create more personal and intimate looking gifts for your clients to give to their close friends and loved ones. Customizable with completely editable text, your business can be represented more appropriately for the occasion which this style of certificate is to be a gift for. 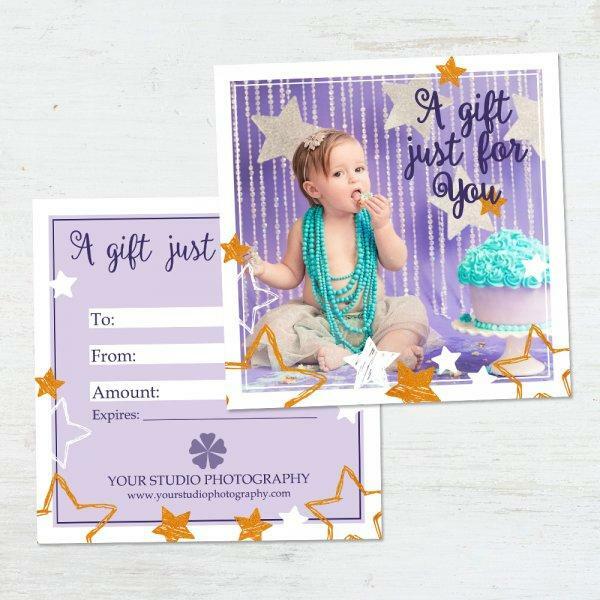 Full of bright stars as well as fun and colorful effects, Our “Stardust” gift certificate template allows you to easily create a gift with colorful and cheerful tones that are great for birthdays and other happy occasions, professionally on a 13x13 flat card. With completely editable text and the ability to work with both the front and back of the card, you will be able to create a gift certificate that best represents your business as well as your particular services in a way best fitting for special occasions. A business benefits when they offer the best choices for their customers. Be that kind of business and they will keep coming back. A great way to create a gift idea suitable for special occasions such as a child's or baby's birthday, as well as other memorable events. 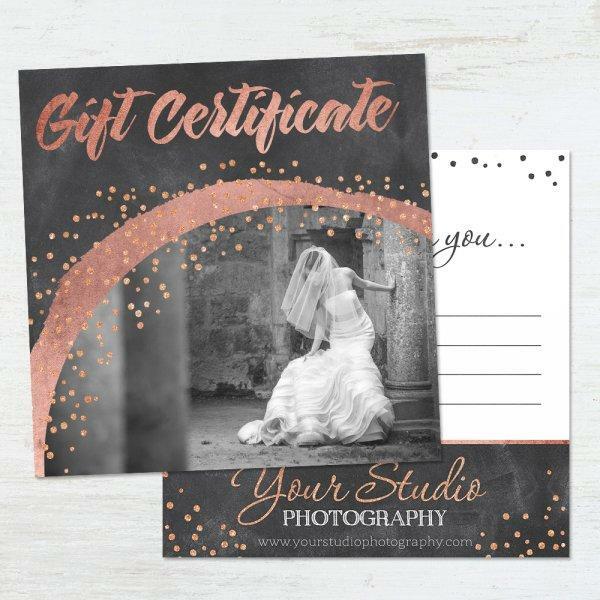 With our new "Tender Touch" gift certificate template, all of the necessary tools are there to help you create a beautiful gift and great representation of you business on an 18x13 flat card. 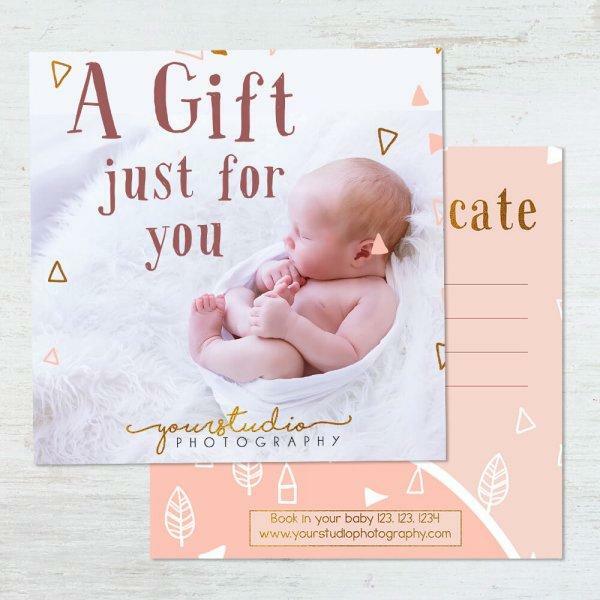 Like our other Photoshop templates, “Tender Touch” also includes completely editable text and ability to work with both the front and back of the card, allowing you to create a gift certificate which is truly unique to your business as well as a great gift that will stand out. Add your own images of soft scenes to go along with the complimenting text, making a nice gift idea for those tender moments.